As a musician and also as an entertainer, Paul Stanley has never failed to wow audiences and fans around the world with his larger-than-life stage persona as well as with his legendary Ibanez PS guitars. With its unforgettable outline, Paul has developed revolutionary ideas, such as using cracked mirror pieces over the body, to truly make the PS model become one of the most iconic guitars in history. To celebrate 40 years since his first signature, the original PS10, Ibanez is proud to introduce the PS1DM, a limited edition model inspired by another iconic design Paul has utilized. 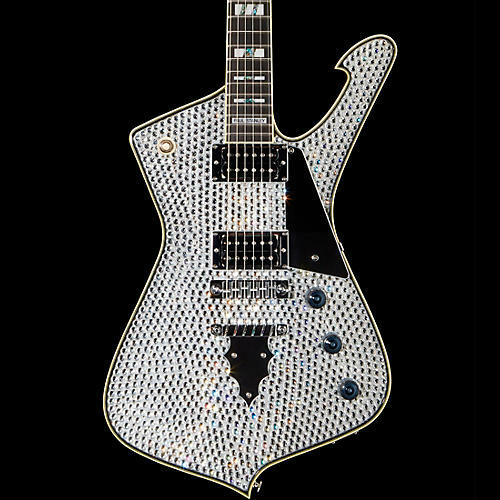 The PS1DM features more than 1,400 pieces of rhinestones carefully laid out on the body, creating one of the brightest stage guitars ever. The standard PS specs are also included, such as the Gibraltar Bridge, Seymour Duncan pickups and Half-Bone/Half Brass Nut, to reinforce his signature sound. PS1DM comes with a special case and Certificate of Authenticity signed by Paul. Production is limited.